X47 armour timer ends in hard-fought Imperium victory. Pandemic Legion staging fortizar in ZMV-9A, Tenerifis saved, TRI anchoring fortizar in Impass. Quiet War continues in Etherium Reach, despite peace overtures. 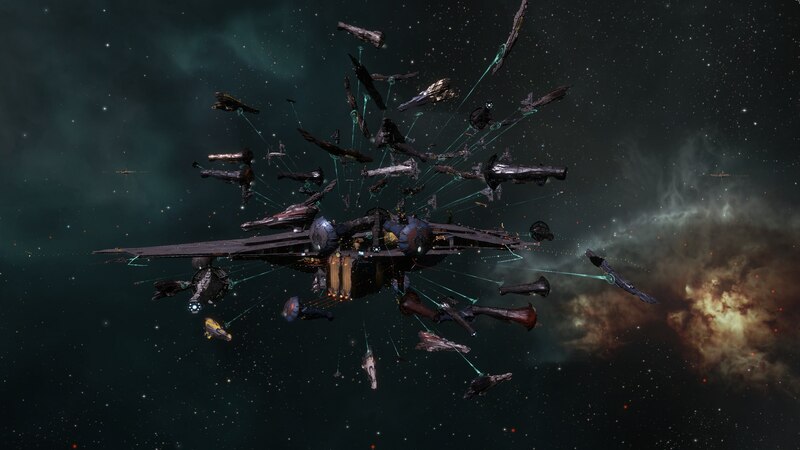 From approximately 1830 EVE yesterday through to 0300 EVE today, the Imperium went toe to toe with the Northern Bloc in X47 in the largest EVE battle since B-R5RB. 526 titans saw active combat. 52 were lost, 28 by the Imperium and 24 by the Northern Bloc. Despite fears of massive server issues, the situation remained at least somewhat stable. While accurate BR links are still being generated, it appears that both sides lost in the region of 1.9trn ISK in system. Total losses in the overall engagement to date, which spans a number of systems, are 4.99trn ISK lost by Imperium, vs 4.12trn ISK lost by the North. Imperium financier Aryth has suggested that the Imperium has a greater capacity for attrition warfare than the Northern Bloc, slanting the slight ISK loss in the Imperium’s favour. This may be the case. What is more important is that the Keepstar was reinforced through to structure. It comes out next Wednesday, the 8th, at around the same time as yesterday. It is expected to be a smaller battle than yesterday’s, as if the North were to lose, they would not be able to dock up their titans in a safe structure. Full after-action reviews and detailed reportage are likely already being written up. NER intends to produce a comprehensive report going forward. If you would like to see an account of the battle from start to finish, look here. While this engagement was a victory for the Imperium, it was a hard-fought one. Credit must be given to the pilots who participated. It is clear that all players fought effectively under very difficult circumstances. The information on ZMV-9A comes from an anonymous source in TEST Alliance. At 1845 EVE yesterday, the Pandemic Legion staging Fortizar in ZMV-9A, Tenerifis, went into armour timer. If it had been reinforced, it would pose a significant threat to continued Eastern Allies operations in Tenerifis. The Eastern Allies judged that it was relatively important, with 419 pilots on-grid, to defend the structure. This included a number of titans. Legacy did ping for it but decided not to engage; instead turning subcapitals north for X47. The Fortizar was therefore saved without a shot. In what appears to be a counter-attack, Triumvirate is anchoring a Fortizar in the Impass system of Y-JKJ8. If this anchoring succeeds, it would pose a substantial threat to Legacy operations in the region. The timer comes out at 1815 EVE. By the time you have read this, the action will already be underway. An NER streamer is on site to cover the situation. Initial intelligence reports that the Eastern Allies are standing down, making the Fortizar’s destruction likely inevitable. In the north-east of New Eden, one last, small, remnant of the DRF clings to space. This is Prothean Alliance, a Russian group with approximately 110 active pilots. They are facing off with Etherium Breach coalition, led by Unspoken Alliance (70 actives) and Bow Down (33 actives). While this may lack the grandeur of X47, the fighting remains ferocious. NER has been told that Etherium Breach is deliberately ceding sovereignty to Prothean Alliance. Prothean apparently cannot use even a fraction of the systems, leading one source to declare the region ‘a ghost town.’ Etherium Breach retains an apparent PVP advantage over Prothean Alliance in most engagements. This was partially demonstrated by the collapse of SOLAR FLEET, Prothean’s Russian allies, last week. Overtures for a peaceful settlement have reportedly been made by both sides. However, these attempts have broken down. For now, it seems, war is set to continue in Etherium Reach.